The University of Georgia, a land-grant and sea-grant university with state-wide commitments and responsibilities, is the state’s oldest, most comprehensive, and most diversified institution of higher education. Its motto, “to teach, to serve, and to inquire into the nature of things,” reflects the University’s integral and unique role in the conservation and enhancement of state’s and nation’s intellectual, cultural, and environmental heritage. a wide range of academic and professional programming at the baccalaureate, master’s and doctoral levels. As a comprehensive land-grant and sea-grant institution, the University of Georgia offers baccalaureate, master’s, doctoral and professional degrees in the arts, humanities, social sciences, biological sciences, physical sciences, agricultural and environmental sciences, business, education, environmental design, family and consumer sciences, forest resources, journalism and mass communication, law, pharmacy, social work, and veterinary medicine. At the first meeting of the board of trustees, held in Augusta on February 13, 1786, Abraham Baldwin was selected president of the University. Baldwin, a native of Connecticut and a graduate of Yale University who had come to Georgia in 1784, drafted the charter adopted by the General Assembly. Josiah Meigs was named president of the University and work was begun on the first building, originally called Franklin College in honor of Benjamin Franklin and now known as Old College. The University graduated its first class in 1804. The curriculum of traditional classical studies was broadened in 1843 to include courses in law, and again in 1872 when the University received federal funds for instruction in agriculture and mechanical arts. Fourteen schools and colleges, with auxiliary divisions, carry on the University’s programs of teaching, research and service. These colleges and schools and the dates of their establishment as separate administrative units are: Franklin College of Arts and Sciences, 1801; College of Agricultural and Environmental Sciences, 1859; School of Law, 1859; College of Pharmacy, 1903; D. B. Warnell School of Forest Resources, 1906; College of Education, 1908; Graduate School, 1910; C. Herman and Mary Virginia Terry College of Business, 1912; Henry W. Grady College of Journalism and Mass Communication, 1915; College of Family and Consumer Sciences, 1933; College of Veterinary Medicine, 1946; School of Social Work, 1964; School of Environment and Design, 2001; School of Public and International Affairs (2001). The Division of General Extension, now the Georgia Center for Continuing Education, was incorporated into the University in 1947. In 1931 the General Assembly of Georgia placed all state-supported institutions of higher education, including The University of Georgia, under the jurisdiction of a single board. This organization, known as the University System of Georgia, is governed by the Board of Regents. The Board of Regents’ executive officer, the chancellor, exercises a general supervisory control over all institutions of the University System, with each institution having its own executive officers and faculty. 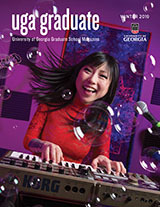 The University of Georgia is accredited by the Commission on Colleges of the Southern Association of Colleges and Schools to award baccalaureate, masters, specialist and doctoral degrees. Contact the Commission on Colleges at 1866 Southern Lane, Decatur,Georgia 30033-4097 or call (404)679-4500 for questions about the accreditation of the University of Georgia. Direct all other queries about programs, services, or admissions directly to the University of Georgia, 706-542-3000. As indicated above, normal inquiries about the University of Georgia (such as admission requirements, financial aid, educational programs, etc.) should be directed to the University of Georgia, not to the Commission’s office.